Sitting is apparently the new smoking, so it is no wonder we have seen numerous products offering to help repair the damage done by uncomfortable and unsupportive seats. Systems such as LUMOback and Valedo use sensors and bluetooth technology to monitor posture and gamify physical therapy but BetterBack goes against the grain, shunning smartphones and algorithms in favor of an affordable low-tech posture trainer. 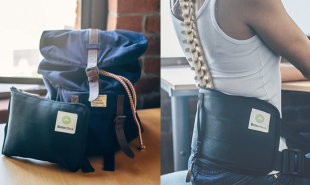 BetterBack is a portable wearable which wraps around the user’s torso and connects to their knees via adjustable straps. The system stabilizes the wearer’s pelvis, restoring the spine’s natural curvature and circumventing the damage caused by unergonomic chairs. Users are encouraged to wear it for at least 15 minutes a day but it is most effective when worn whenever the user is seated. The device discourages slouching, builds the relevant muscles and helps the body intuitively improve its posture — even when the wearer takes the BetterBack off. BetterBack is currently crowdfunding on Kickstarter and has already surpassed its USD 12,500 target more than 30 times over. Pledgers can pre-order for USD 49 and the product is expected to retail for USD 99 from November 2015. Are there other wearables which could help undo the problems caused by excessive sitting?